Marvin Johnson passed away, April 22, 2017. He was 83 years old. Marvin was a long time ham, and faithful supporter of LARC. He held the position of Treasurer for many years. Always a gentleman, know for his kind smile, he will be missed. 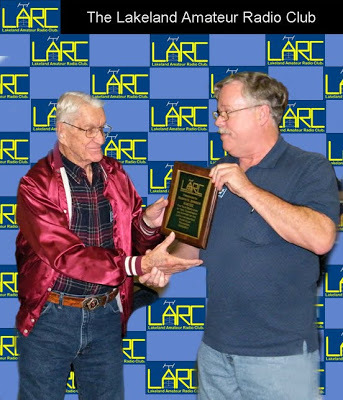 Marvin Johnson being presented with an award for his his many years of service as club Treasurer by then President and now Treasurer, Patrick O'Neil. This picture was taken in 2012.